Karen Dolley was fast asleep in her Indianapolis home when she heard a man break in. That’s when Dolley’s medieval fight training kicked in. The 5’6″ Dolley punched the intruder 10 times into a corner of her bedroom. She then reached for a gun in a nearby drawer but accidentally opened the wrong one. Unfazed, Dolley grabbed a backup: her ninjato, a Japanese-style sword. 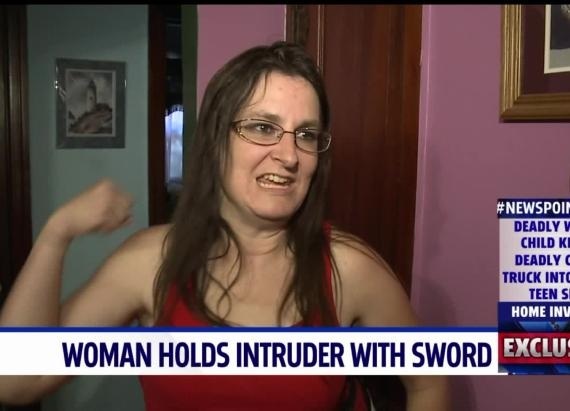 Holding the intruder at swordpoint, she called 911 and kept the intruder cornered until police arrived. Dolley said she was surprised and acted in the heat of the moment.“I didn’t think I was getting good blows in but my knuckles are bruised today,” Dolley told IndyStar on Friday. Dolley spend her teenage years with the Society for Creative Anachronism, a group that recreates European arts and life from the 17th century and before. Dolley’s role was to engage in non-choreographed fights using rattan swords.